This project is eligible for the Youkauf Cash Back Program, on Indiegogo this results in a special price for the 'Personal' package. Since his birth Bastian, the founder of our company, is visually handicapped. Since the early 2000s he uses mobile phones that incorporate cameras to find his way. Throughout the years the cameras in mobile phones have dramatically improved and on modern smartphones there is a huge number of magnifying apps to choose from. The only time he had to rely on proprietary solutions provided through the medical aid industry was at home when he wanted to read long-form content like books, newspapers and magazines. The reason was that using the phone for reading long text is incommodious. To find a solution for using a smartphone to read long-form content he teamed-up with his father, who is a mechanical engineer, and together they came up with the concept for the SmartReader. Obviously the primary problem was to keep the phones camera in a proper distance from the text you want to read without having to hold the phone yourself. The solution was a bracket made from transparent acrylic that supports a phone mount. You can see a sketch of the original acrylic bracket above. The next problem was how to mount the phone to the bracket. The solution was not hard to find, since the problem has been solved in modern selfie-sticks. We tested this prototype quite thoroughly and found that the SmartReaders value could be greatly improved by making it more adjustable and easier to take apart for transport. We changed the screw securing the ball head and the smartphone bracket to a grip screw. This was not only a change of parts, the acrylic bracket had to be modified as well. The result was exactly how we envisioned it: The final version of SmartReader. The current version of SmartReader supports smartphones up to 5 inches. This for example includes all iPhones except the Plus models. Since we are a technology company and have developer resources at hand we also provide our own Magnifier App that is already available on the Apple App Store. A version for Android is planned. We hope to exceed our funding goal, which would enable us to direct developer resources to developing the Android version. Perhaps even one for the open source Sailfish OS. The Magnifier App is not required for using SmartReader. You can use the magnifying App you like best. Feel free to discuss the App and its features in the 'Community' section, reach out to us on social media or visit our support forums. You can find more information about the free Magnifier App on our homepage. Describing the usage of SmartReader is hard. 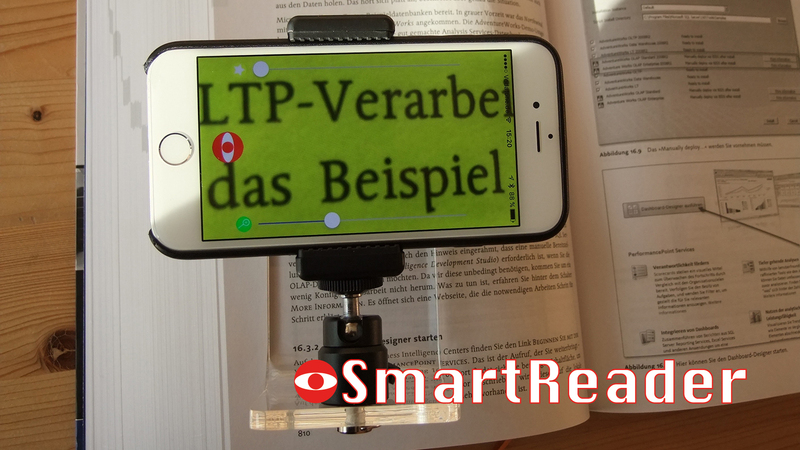 Therefore we created a tutorail video that shows you how SmartReader and the Magnifier App work together. Usage scenarios are limitless! Here is one exmple: Bastian's father is using SmartReader and the Magnifier App to read and comment a blue print. We are posting this project to Kickstarter, because we want to make SmartReader and the Magnifier App available to a broad audience and to achieve this nothing is better than a crowdfunding campaign. As mentioned above we are also looking for funds to expand the free Magnifier App and bring it to more platforms like Android and Sailfish OS. You get a tool that helps both handicapped and elderly people to read longer texts without effort. Our retail price for SmartReader is 59 Euro, but for this Kickstarter you can get it for 44 Euro. On the higher rewards you also get higher discounts per piece. We'll also mark everyone who contributes to this campaign and joins our support forums with the rank of 'Contributor'. That way we want to honor and encourage everyone to join the community and help the future development of SmartReader and the Magnifier App. This campaign started mid January and will conclude mid February. We expect all backer surveys to be completed till the end of February. Afterwards the sourcing of components with shipping to our assembly location will take 2-3 weeks. Therefore we expect deliveries to start at the end of March or early April at the latest. We appreciate all of your support and want to encourage you again to communicate with us via Facebook, Twitter, Google+, the Kickstarter Community or our support forums.